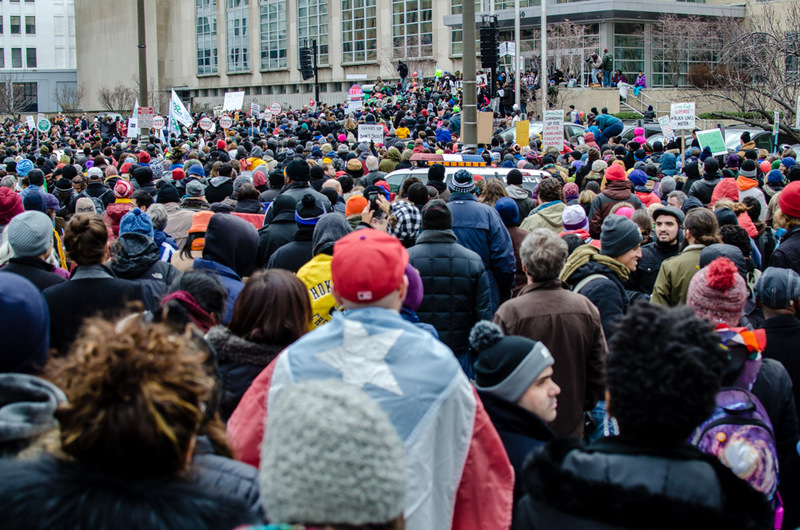 Under gray skies and braving cold winds, over 2,500 people rallied outside of the School District of Philadelphia’s central office at 440 North Broad Street. The crowd included a father, with his family, wearing a large paper hat that read “Start seeing white privilege” and a woman holding a sign inscribed with the words “He that opens a school closes a prison.” Several speakers took podium on the steps of 440 North before the march began; moving south and then east, the mass procession circled City Hall, spanning multiple blocks at a time and was flanked by a large police presence, before ending with another rally at Independence Mall. Speakers at Independence Mall included members of the Philadelphia Student Union, People United for Real Power (PURP), and the mother of Brandon Tate Brown, a 26 year old man gunned down by police last December during a traffic stop in the Mayfair section of Philadelphia. Fully funded, democratically controlled schools. $15/hr minimum wage and the right to form unions. While these are broad demands, The Declaration spoke to the Reverend Gregory Holston, pastor of New Vision (UMC), co-chair of the economic dignity team of religious activist group (and DARE member) POWER and chair of DARE’s demand committee. Reverend Holston explained the concrete details behind these demands. On the issue of full funding for the city’s schools, the Reverend explained that DARE had been considering several different proposals for a more equitable funding formula, but had not settled on a single option. He said that DARE did plan on holding Governor-elect Tom Wolf accountable for his promise to more fully fund public schools. However, on the issue of “democratic control,” Holston and DARE are explicit: democracy means abolishing the School Reform Commission. Asked if he believed abolishing the SRC could endanger reform in the troubled Philadelphia school system, Holston said “I believe in democracy” because it makes individuals more responsible, and commented that after other methods had failed, he thought it was sensible to try out a democratically run system. While DARE’s education demands are fairly broad and self-explanatory, their demands in the “jobs” and “justice” categories, as they call them, are somewhat more concrete. For instance, unlike their education demands, they have a specific plan they’re following with regard to an ambitious minimum wage increase to fifteen dollars per hour. In the Commonwealth, local governments are prevented (or at least widely seen as being prevented) from raising minimum wages by an amendment to the state’s Minimum Wage Act passed in 2006. The amendment states that Pennsylvania’s wage act “preempt[s] and supersede[s] any local ordinance or rule concerning” minimum wages. Wage hike advocates counter that the preemption clause is vague, and contend that because of this perceived ambiguity, the state Supreme Court could rule in their favor. The Reverend told one of the authors that DARE is pressuring the city to raise the minimum wage locally to precipitate a legal showdown over the preemption. Similarly, the demand to “end stop and frisk” is a simple formulation of a storied issue. In 1968, the U.S. Supreme Court decided, in the case of Terry v. Ohio, that it is constitutional for police to briefly “stop” individuals on whom the police have “reasonable suspicion” of criminality. Similarly, if an officer has a reasonable belief that their safety is compromised, they can perform a limited “frisk” of a person for weapons. While the phrase “stop and frisk” was already in use in 1968 (it’s used multiple times in the court’s opinion), according to Reverend Holston, the tactic is now used as a general deterrent against crime, without reasonable suspicion of criminality or danger. In support of this claim, the Reverend cites Bailey v. City of Philadelphia. As part of the settlement in that case, the plaintiffs are given extensive access to stop and frisk data from the city, and make reports based on that data. 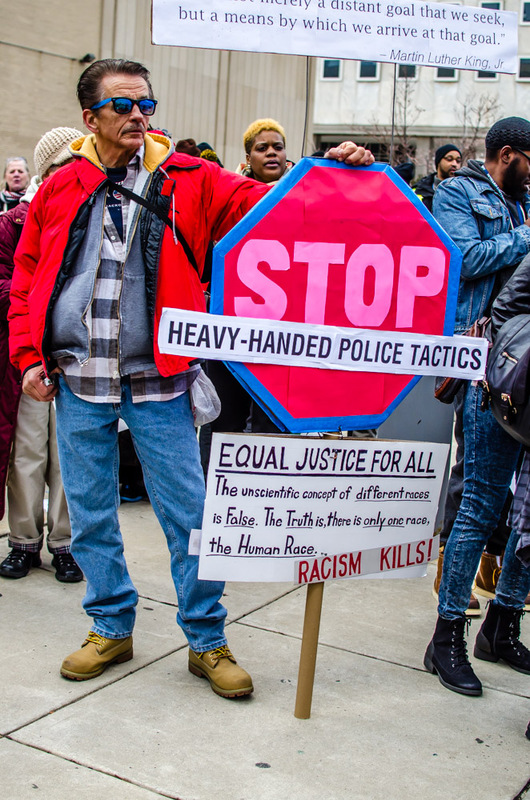 According to Holston, these reports show that Philadelphia Police officers continue to stop and frisk a large number of people without reasonable suspicion, potentially because of their race. It’s this practice – not constitutional stops and frisks – that the Reverend and DARE want to stop.